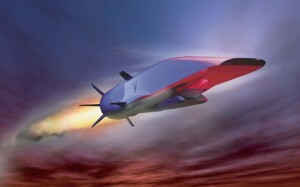 The U.S. Air Force recently announced the of a brand new hypersonic aircraft capable of going 5 times the speed of sound. For now, the target date for completion of the unmanned flying weapon is 2023, which is obviously subject to change. “The key thing is, hypersonics go really fast,” outgoing Air Force chief scientist Mica Endsley told CNN. While the statement above is not exactly a revelation, it simply embodies how tough it is to create an aircraft capable of traveling across the entire United States in approximately 30 minutes. Last year, Air Force Maj. Gen. Thomas Masiello called hypersonic technology a potential “game-changer” that will transform the nature of warfare, which explains why the US, China, and Russia are all working extensively on the technology. The last hypersonic aircraft the military tested was back in 2013, when the the X-51A Waverider hit Mach 5 before smashing into the ocean as intended. Only time will tell how the new hypersonic aircraft will perform, but I do know 2023 seems like a bold deadline.